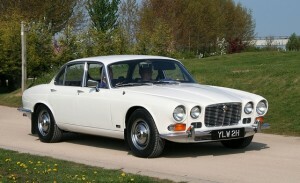 The Jaguar XJ6 Series 1 and early Series 2 cars used a 3 piston version of the Girling brake calipers found on most contemporary Jaguars. Very early cars used a solid front disc and the same brake caliper as the late S-Type. 24 mm vented front discs and modified calipers were introduced on later Series 1 cars. The rear brakes were essentially the same on all versions. Eventually Jaguar fitted a four piston front caliper to the late Series 2 XJ6 – please note that our brake upgrade is not suitable for the later Series 2 and 3 cars. To help rejuvenate the brakes of your early XJ6 we offer a several Jaguar XJ6 brake upgrade kits featuring our own four piston caliper. For owners of early Series 1 cars with solid discs we can also offer a vented brake upgrade – see our Performance Kit listed below. As with all of our brake upgrade kits, the Jaguar XJ6 options can be installed without permanent modification to the car. The calipers are carefully sized to ensure they remain compatible with the existing brake master cylinder and servo assembly. All kits are supplied with braided stainless steel brake lines.